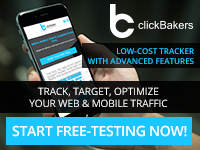 clickBakers is a smart solution for affiliate managers, advertisers, and media buyers to maximize all types of web and mobile traffic. Our easy-to-use platform and progressive tools will help you improve traffic performance with analytics, segmentation, targeting and optimization. We offer precise mobile tracking, accurate carrier targeting, intelligent post-click optimization and advanced traffic segmentation.